The Bashar al-Assad regime and its Iranian-backed terror groups on Saturday continued heavy bombardment in residential areas of Syria’s northwestern Idlib province. According to civil defense sources, who spoke on condition of anonymity, a civilian was killed and five other civilians were injured in the attacks in southeastern Saraqib city. 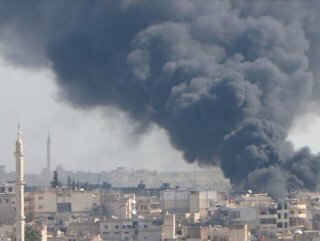 The residential areas are under heavy bombardment since early Saturday. Regime attacks in Idlib’s de-escalation zone are estimated to have killed at least 112 civilians -- and injured more than 340 others -- since the beginning of 2019. The fresh wave of attacks in Idlib has reportedly led to a new refugee exodus from Khan Sheikhun and Maaret al-Numaan. Since February, nearly 6,900 families have migrated to safe areas near Turkey's border. In September 2018, Turkey and Russia agreed to turn Idlib into a demilitarized zone after a meeting between Turkish President Recep Tayyip Erdogan and his counterpart Vladimir Putin in Russia's coastal city of Sochi. Ankara and Moscow signed a memorandum of understanding calling for the stabilization of the situation in Idlib's de-escalation zone, in which acts of aggression are prohibited.